Why the best may not be what you think! As a professional, I am often asked what is the best tire dressing. Just like many other areas of life, finding a good tire dressing is an area that is filled with much bad information. While a casual observation would lead most to oversimplify the decision process, most people grossly underestimate just how diverse the subject is! Not only are we buried with hundreds of choices of tire dressings, but we are also buried in varying opinions as to what the pros and cons of tire dressings are in the first place. The difference between water base and silicone base tire dressings. Darren's top pick for tire dressing. Visual enhancement for the sidewall. The reality is that while most tire dressings are labeled as both shine creators and tire protectors, most tires will have to be replaced due to worn tread before the damages of weather would ever cause you to replace your tires. So in my professional opinion, most people including myself are more concerned with the visual enhancement of a quality tire dressing than the tire dressing's ability to actually prevent premature aging. Water base can be diluted with water. Silicone/solvent/oil base dressings are made to be water resistant and last longer than water base dressings. 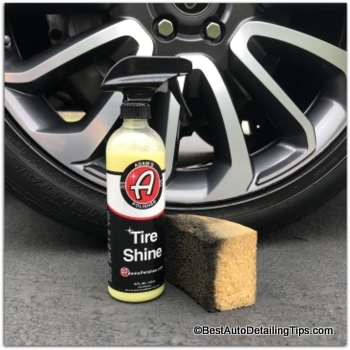 It used to be that oil/silicone based tire dressings that are promoted as log-lasting tire shine, were a major problem when used over long periods of time as they would collect dirt and dust causing most people to add layer upon layer of this shiny stuff. After a period of time, what was being created was a thick, greasy build-up of tire dressing and dirt. Oil based dressings that stand up long term. Oil based dressings that dry to the touch eliminating the majority of the dirt build-up. With these advances in chemical engineering, now the major decision in shopping a top rated tire dressing will comes down to other factors based on whether you are a professional doing many cars, or a driveway detailer working on your personal cars. Since the world at large tends to grossly over-simplify everything, big business exploits our ignorance to their advantage of endlessly figuring out clever ways to separate you and your money. So shopping for what you consider to be the best tire dressing will be a disappointing experience over the long term as the industry will package their tire dressing in ways that will lead you down the wrong path. Darren's Tips: If you decide you are going to run out and purchase an off-the-shelf tire dressing and ignore my professional recommendations, then really any tire dressing will likely perform to your satisfaction. 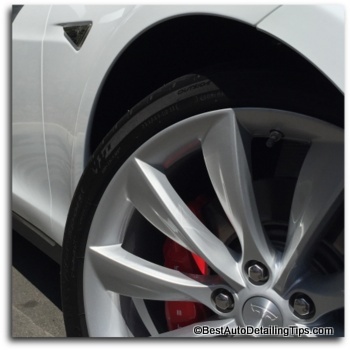 If you like the idea of getting a higher quality tire dressing with the added benefits of advanced chemical engineering, then follow my suggestions below. Perfect size for any car owner looking for professional results without having to buy excessive amount of product. Exceptional results with no sling! One of my favorites in a bite-size amount. Smaller size so you can test before committing to a gallon size of professional tire dressing. Not as big as a gallon, but bigger than the Adama's Tire Shine above if you are transitioning into doing more cars on your way to a full-fledged professional detailer. or looking to become a professional detailer?" Based on the answer to that question will impact the products I recommend and will impact the way you choose to purchase your detail supplies. Driveway detailers need limited amount of product. Professional detailers generally buy in bulk to save money. "Darren, why would I want to buy a top rated tire dressing in a gallon size and why these particular brands?" They are more economical in gallon size. Both are water based and can be diluted down with tap water for different uses. 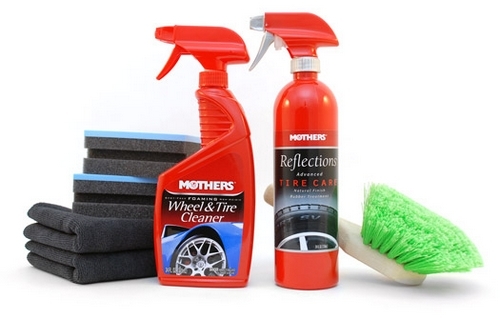 I have used both products professionally and have tested in the real world of professional detailing. I consider both to be equal in performance. Based on the cost of these two products, likely most of you will choose the Chemical Guys VRP. Of course I have opinions based on personal preferences as well as insights from my professional detail business. I have used both products for all tire, engine, interiors (I rarely dress interiors as a rule), and wheel well dressing; I dilute accordingly. For ultimate shine on tires; spray directly ( with a traditional trigger sprayer and bottle) on tire sidewall and leave. Clean overspray from wheels as needed and mop up any excess dressing. For engines: spray dilution as noted above and let stand. Dressed areas will go from white to clear after a few minutes. The natural follow up question after picking he best tire dressing is choosing an applicator. I often find myself wondering how this industry I am part of has yet to come up with better solutions to some very basic needs. Tire dressing applicators has been one of those. And like many other times in my professional life, I find I must go outside my own industry to find that winning combination. The grout sponge below is the best tire dressing applicator I have ever found and continue to use to this day; over 10 years later! When you order one; you are really getting two. I cut in half and get two for the price of one. I like the thick side for handling, and the thin edge for applying dressing to the tight area between the wheel lip and the tire side-wall. Get sponge completely wet with tap water, then wring out as tightly as possible. Apply your choice in tire dressing to the flat side of the sponge; not to the side wall of the tire. After you use it, you can either let it dry as is, or rinse and let it air dry. Either way, make sure to get wet, wring out, and your applicator will last you months to years based on how often you use it. No other applicator I have ever used comes close to the user experience of this sponge.